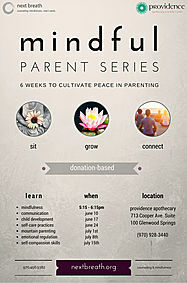 A 6 week, Mindfulness-Based series for parents with kids of all ages. a. Practice 1 mundane act (eating, brushing teeth, shower, drinking, etc.) mindfully each day and write a short paragraph about your experience using thoughts, feelings and sensations. Dan Panzarella, MA. LPC, is a licensed professional counselor, family therapist at the Youth Recovery Center at Valley View Hospital, and mindfulness instructor. His dedication to supporting familes and parents stems from years of professional experience, personal struggles and mindfulness practices. As a loving and imperfect father, Dan strives to become the best parent and husband he can be while supporting others.